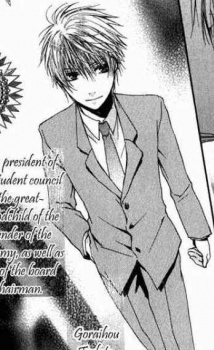 The Student Council President. Year 2 Class A. He is the son of the school board chairman. Despite his bishonen appearance, he can be wicked. He usually handle situations with violence and evil schmes (like blackmailing). He also has a weird habit of making Shinya and Mashiba to cosplay during their cases.